The Potato (Solanum tuberosum) is a perennial agricultural plant of the Solanaceae, or nightshade, family, best known for its tuberous roots, which are eaten widely as a staple vegetable. It is one of the most widely used vegetables in Europe and North and South America. The word potato comes from the Taino word, batata, meaning sweet potato, via Spanish patata. Potato tuber grows underground, has an uneven shape, and a thin skin that is usually red, yellow, or brown. Inside the potato is pale flesh. Potatoes are an important food source over the world. 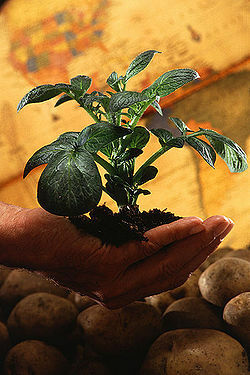 Potatoes are the most widely and easily cultivated vegetable in the world. Potatoes were originally cultivated in South America, and in Bolivia, Chile, and Peru which are in Andes mountain range. More than 400 years ago, the Inca Indians grew potatoes in mountain valleys. An average-sized potato weighing between 6 and 8 ounces contains less than 100 calories. Potatoes consist of about 80 percent water, 20 percent solid matter, and have a high nutritional value. Starch makes up about 85 percent of this solid mass and the rest is protein. Potatoes also provide vitamins including niacin, riboflavin, thiamin, and vitamin C. They also contain minerals such as calcium, iron, magnesium, phosphorus, potassium, sodium, and sulfur. There is one thing to be careful about when you eat a potato. If you see a bud come out of the skin of a potato, you should not eat it. Because, the bud contains solanine which is a kind of toxic substance. The topic: potato Created by Annette Lamb and Larry Johnson, 9/02. This page was last modified on 10 November 2013, at 21:26.